I am helping to organize a little bike ride this Friday (the 15th) after work. 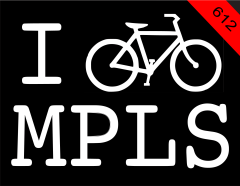 We'll meet up at Mississippi River Blvd and Summit Avenue in Saint Paul (near Saint Thomas University) at 5pm ...and bike downtown (via Highland park, over the river on I-35 bridge and down the water street bike path). We'll stop at Cossetta's or Great Waters (in Downtown) for a snack/beer and then head back up to Summit avenue, ending at Billy's on Grand for more food and drink. The entire ride is about 11 miles and there's only one major, but short uphill climb (at the end)! If it's pouring rain, the raindate is the following day (Saturday the 16th), at 3pm, with the same meetup spot. Meet other cyclists! See new parts of the city! learn about cycle advocacy opportunities!